Recreation Outdoor eXchange (R.O.X.) introduced another outdoor activity last September 27, 2012 at its branch in Bonifacio High Street. Alpine mountain climbing was at the spotlight this evening, with Romi Garduce, first Filipino Seven Summit climber, enlightening the crowd. Garduce, who was been climbing mountains since he joined the UP Mountaineers in 1991, is the first Filipino to accomplish the feat of scaling the Seven Summits. The Seven Summits are the highest peaks in all seven continents, namely Mt. Kilimanjaro in Africa, Mt. Aconcagua in South America, Mt. Everest in Asia, Mt. Elbrus in Europe, Mt. McKinley in North America, the Cartensz Pyramid in Oceania, and the Vinson Massif in Antartica. It was in January of 2012 when Garduce completed the seven by conquering Vinson Massif. In his talk, Garduce spoke about his years as a mountaineer, the challenges he had to face, and the preparation he had to undertake before facing each mountain. As an alpine climber, one must be completely self-reliant, toting all items needed for food, shelter, and safety while going up a mountain. In addition to carrying this load, one must be at the height of physical fitness, as well as mental preparedness. Garduce shared behind-the-scenes stories about his quests, with a short video on climbing Mt. 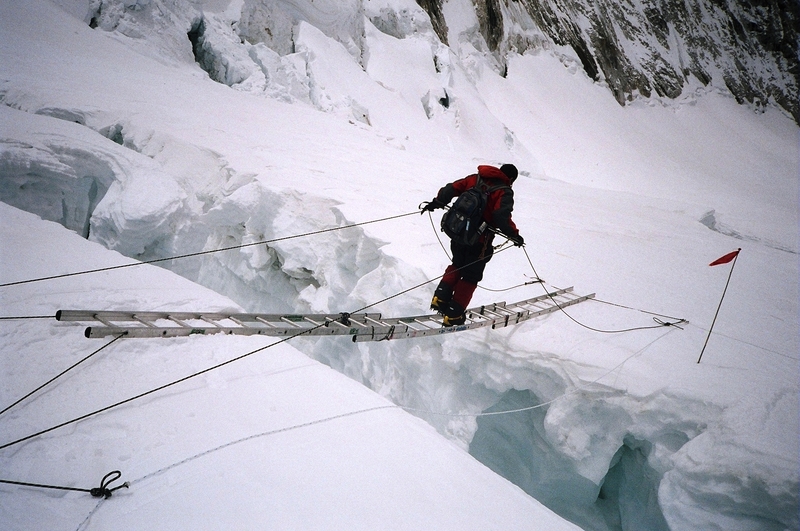 Everest, the world’s highest and most treacherous peak to climbers. He also shared tips on training and health, climbing gear, and how to get started on this grueling mountain sport. All mountain photos for this post were shared as part of the press kit and were taken by Romi Garduce and Levi Nayahangan. Garduce’s talk was supplemented by the week-long Alpine photo exhibit at the R.O.X. Bonifacio High Street branch, which was held from September 24 to 31. R.O.X. is owned and operated by the Primer Group of Companies, Asia's next retail giant. Two days ago, I was sent by Dispatch Media to attend a press conference for Mountain Hardware athlete, Mike Libecki. My mind went black and I was like, "Sino si Mike?" (Mike who?). The conference was at Abe restaurant in Trinoma Mall which I haven't tried before so that made me excited. Haha! Mike Libecki came in with the gang from the Primer Group, the conglomerate that distributes Mountain Hardware in the Philippines. He is a multi-awarded climber and a recipient of several grants that is given to climbers in pursuit of remarkably challenging ascents with minimal impact to the environment and has appeared in films/interviews with National Geographic, Discovery, History Channel, Outside TV, etc.. Despite all these big accomplishments, he claims that his favorite award is winning father of the year - which he won on numerous occasions. Sweet! :) Below's the video that was shared to us by Mike. Woooow, he's really living it up! Around The World With Mike Libecki from Red Frog Interactive on Vimeo. 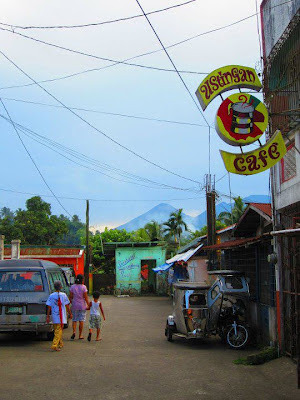 As I write this, Mike and several local mountaineers is in a documented expedition to Mt. 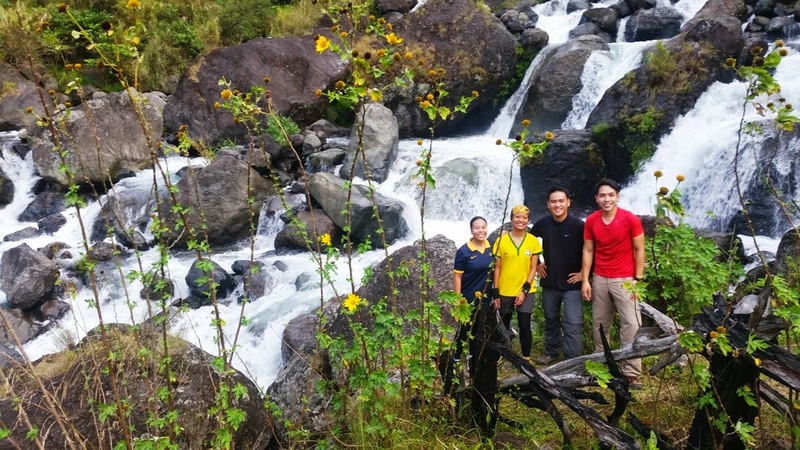 Amuyao, one of the most beautiful trails in the Philippines found in the Cordillera region. 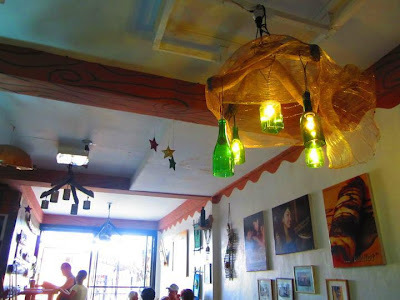 The long, challenging hike also comes with a noble purpose as their team will also be distributing portable solar lamps to the community in Pat-yay, Ifugao. Mountain Headwear made its way to the country through R.O.X, and opened its first store in Southeast Asia last July 30 at the second level of TriNoma Mall. Its second branch in the Philippines will open at SM Lanang on September 28, 2012. Mountain Hardwear is exclusively distributed by The Primer Group of Companies, Asia’s next retail giant. Two months back, I joined several blogger friends in the Book Sharing Project initiated by James Betia of Journeying James. The team worked closely with Emm Balabat, an alumna of Rizal Elementary School in Gubat, Sorsogon. The goal was to help fill up a library with books which the alumni association and other members of the local community heavily worked on putting up. What made this project special was that it would be the first library of this school in 50 years! Last September 14, the Rizal Elementary School library finally opened its doors to the public. We witnessed the opening along with the excited members of the community, a bulk of which were grade school students. TV5 also graciously covered the event. A selected number of students performed prior to the ribbon cutting ceremony. Apart from the opening, we also shared 400 slippers to the kids. P.S. Special thanks to chef Arvin Quiloy for the delicious food that he and his team prepared for us. Thanks to the LGU as well for taking care of some of the meals. :) My delighted tummy sends its regards. :P Emm, James & Nikki, I can't thank you enough for taking charge! Join me and other running enthusiasts as we take on Mt. Pinatubo's rough course, a combination of sand, granite and water. Hope to see you there on October 13, 2012! :) More details below. *Contact them first to check if there are still available slots. Transportation to the venue is not included in the registration fee but you may acquire the shuttle service of Pinatubo Tours who will be bringing you to the staging area. Fee : PHP 550 per individual. 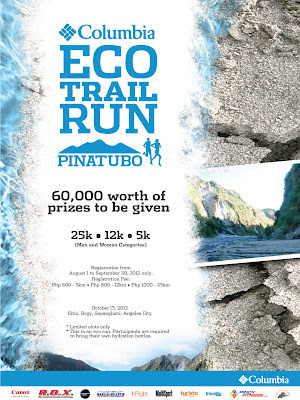 The Columbia Eco Trail Run Pinatubo is organized by Adrenaline Multisport headed by Thumbie Remigio.